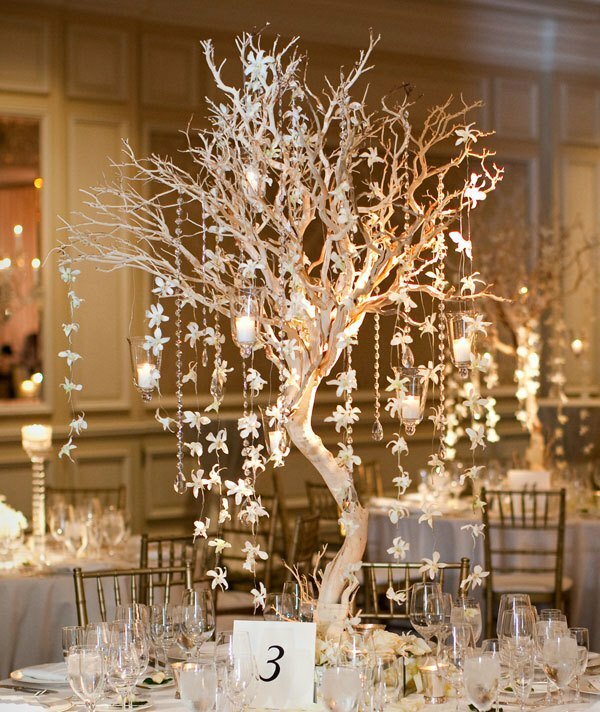 When it comes to your reception wedding centrepieces will be the decorative focal point. With a choice of floral types and colours, either tall or short arrangements, lanterns, trees and candles there is something for all budgets and tastes. There are so many different options available to couples these days. If you are a fan of flowers then opt for seasonal blooms. A good florist can help you make the right choices and stay on budget. Alternatively, a decor company could provide you with artificial flowers arrangements, candelabras and even a chandeliers attached to your table as a centrepiece! I have collected a few different looks, some of them simple and others a little more elaborate. I hope they will help inspire you for your big day. For further ideas, take a look at my wedding centrepieces Pinterest board.